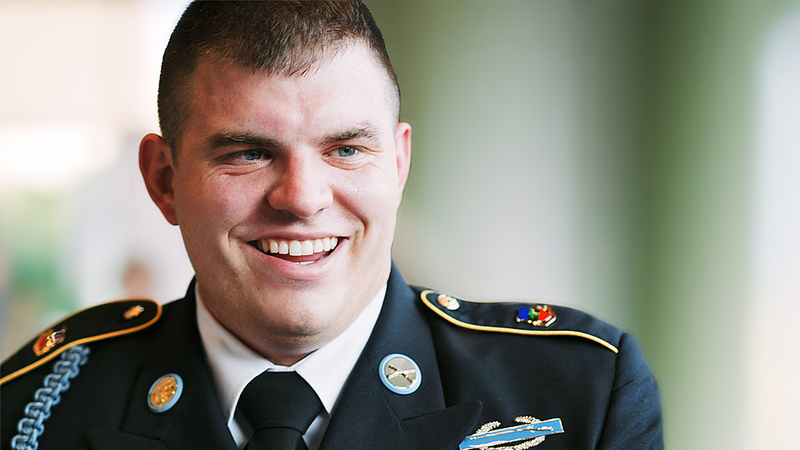 Retired U.S. Army Staff Sergeant Travis Mills of the 82nd Airborne is a Recalibrated Warrior, motivational speaker, and international advocate for veterans and amputees. He is one of only five servicemen from the wars in Iraq and Afghanistan ever to survive his injuries as a quadruple amputee. He started the Travis Mills Foundation, which benefits and assists wounded and injured veterans. 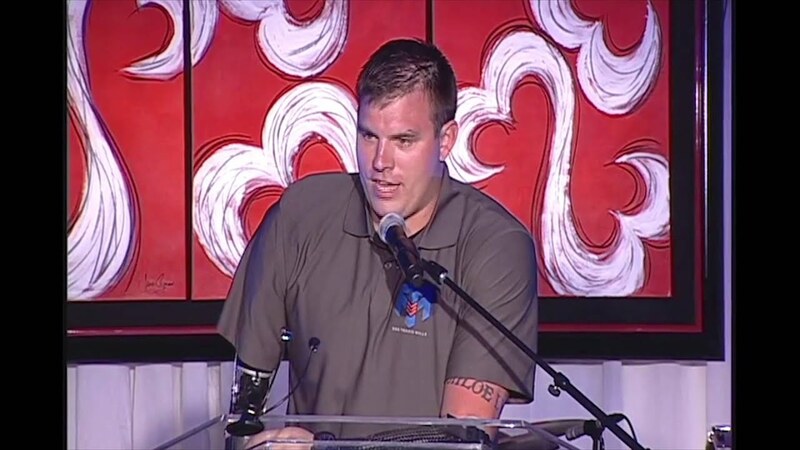 Travis Mills’ keynote speech teaches and inspires audiences nationwide to “Never give up. Never quit.” no matter the obstacles or circumstances. Mills’ larger-than-life personality, sense of humor and incredible spirit for life engages audiences from the moment he takes center stage. On April 10, 2012, United States Army Staff Sergeant Travis Mills of the 82nd Airborne was critically injured on his third tour of duty in Afghanistan by an IED (improvised explosive device) while on patrol, losing portions of both legs and both arms. He is one of only five servicemen from the wars in Iraq and Afghanistan ever to survive quadruple amputee injuries. Thanks to his amazing strength, courage, an incredible will to live, the heroic actions of the men in his unit, the prayers of thousands, and all the healthcare providers at the Walter Reed Army Medical Center, near Washington D.C., Mills continues to overcome the obstacles of living life as a quadruple amputee. Every day is a battle, but Mills continues to astound everyone with his progress and with his amazing spirit. SSG Travis Mills is a genuine American hero, and for his incredible sacrifice, we are forever in his debt. In September 2013, Mills founded the Travis Mills Foundation, a nonprofit organization, formed to benefit and assist wounded and injured veterans. Mills and the foundation are actively involved with several veterans organizations namely, the Travis Mills Foundation Retreat in Maine. Mills’ story inspired the creation of the documentary Travis: A Soldier’s Story which played in theaters nationwide and has been featured on local and national news including Fox News’ Happening Now with Jenna Lee, The O’Reilly Factor with Bill O’Reilly and CNN with Barbara Starr, and The Ellen DeGeneres Show. Mills’ story is being adapted into a major motion picture directed by Sylvester Stallone and starring Stallone and Adam Driver. Discover how you can spark inspiration within your organization. Visit Travis Mills’s Company Reads page to learn more. During his three combat-filled tours of duty in Afghanistan, former college sports star and skilled paratrooper U.S. Army Staff Sergeant Travis Mills never once backed down from the hardest challenges that came his way. The big, likable guy literally woke up every morning proudly singing the 82nd Airborne song to encourage and motivate the men he led. But late one afternoon in April 2012 while he and his men were on a routine mission near a remote village in southern Afghanistan, the unthinkable happened. While patrolling for improvised explosive devices (IEDs), the minesweeper missed one IED, and Mills' world changed forever. In his vivid lectures, Mills recalls his heroic fight for survival, the action-packed and challenging days of his earlier tours of duty with the legendary 82nd Airborne Division, the agony of encountering a hidden bomb while on patrol with his men, and his odds-defying physical and spiritual struggle afterward to come back from severe quadruple amputee injuries and rebuild his life. 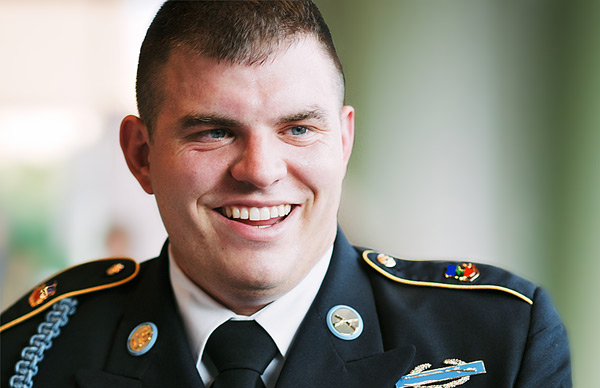 Travis Mills' story inspires, encourages, challenges, and motivates audiences to move forward. He illustrates how resilient the human spirit is, how unbreakable the will is when pressed with difficult demands, and how triumphant a person can be when tasked with the seemingly impossible. “Travis was amazing! Not only as a person but as a speaker! We received nothing but positive feedback from attendees, board members, staff and volunteers. Many said he was our best speaker ever! His speech was engaging, inspirational and super funny. I honestly in all my years of marketing and attending events haven’t heard anyone as personable as Travis and I’ve seen many famous speakers. 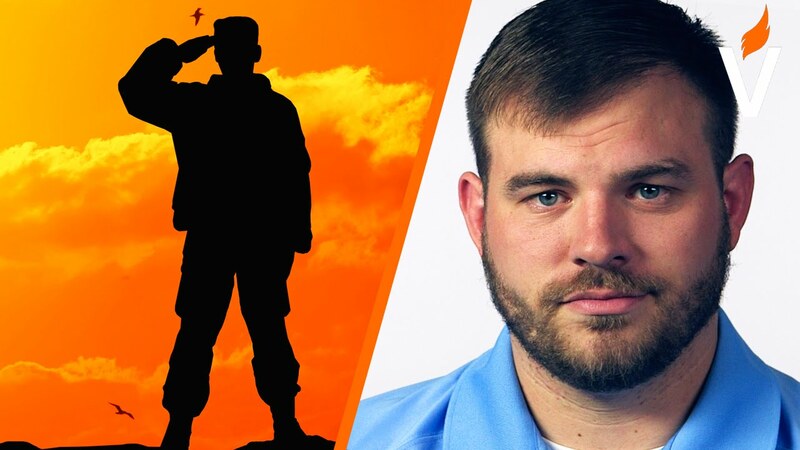 SSG (Retired) Travis Mills is one of the finest public speakers I have ever listened to…Recently Travis spoke at Lutheran Theological Southern Seminary in Columbia, SC to a packed house. Weeks later, he is still mentioned every day here at Southern. His upbeat perspective and limitless optimism have changed the outlooks of many future pastors here. I highly recommend SSG Travis Mills as a very fine public speaker and leader. 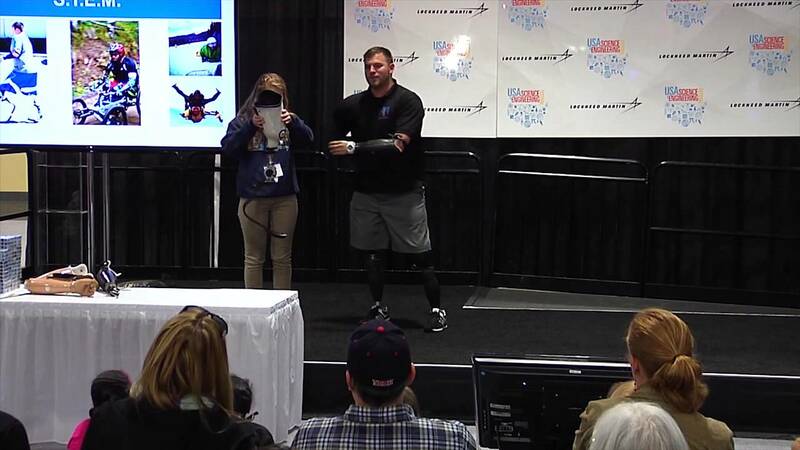 More than 325,000 people attended the recent USA Science & Engineering Festival and had the opportunity to hear Veteran Travis Mills talk about how engineering and technology – coupled with his inspiring motto of “never give up, never quit” – helped him overcome unimaginable circumstances. Travis is one of the most inspiring and encouraging stories of our generation! Travis is a terrific public speaker, who fluctuates between humor and sobering sincerity. It is inspiring how he far he has come since his tragic injury, and the fact that he is spending his time and energy to support men and women who have endured a similar experience is extraordinarily brave. Travis was highly entertaining while providing thought provoking insights on his experiences and current mission. His message resonated with the audience and he guided them through a brilliant presentation on setting goals, innate motivation, persistence, and having purpose to one’s life. Travis moved the audience across the emotional spectrum from laughter to tears. He blends wisdom and experience into a mesmerizing presentation. I’ve seen dozens of speakers over the years but can only recall a couple. Travis, is and will always be, at the top of that list. A story of hope and resilience, and a reminder that no matter what life may throw at us, as Travis says, as long as we “Never Give Up, Never Quit”, we can achieve anything we set our hearts and minds to. He is quite simply a great American and an example for us all. The problem with guys like Travis, is they make guys like me look like lazy whiners. What this man did for our country is heroic. What he sacrificed is unimaginable. And what he’s written is simply unforgettable. Read it. I promise you’ll feel better about whatever ails you. This book exemplifies the qualities that made Travis an outstanding soldier: it is gutsy and honest, filled with humor even in the darkest moments, and always driven by a love for both family and country. [Mills is] thriving, not just surviving, and inspiring others to overcome their own seemingly insurmountable obstacles.